I received this book from the author with him asking if I would mention it on my blog. I’ll do one better and give a quick review. 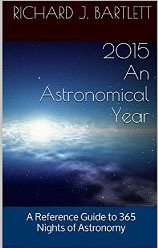 2015 An Astronomical Year: A Reference Guide to 365 Nights of Astronomy is a guide to where all of the celestial bodies will be in 2015. The descriptions the author has given are very easy to follow, and with the images, easy to spot in the night sky as well. He uses a glossary at the beginning of the book, describing what each of the words mean making it easier to understand everything in the book and the night sky. Images have been used to make it even easier to see where the stars, planets, galaxies, asteroids are on each given day. He has given times in GMT and how to tell where the stars will be in your part of the US. This is the only gripe I have with this book, Bartlett only gives times in UK and US. Having times in Australian, Calcutta and maybe Canada would have been handy as well. Maybe a later revision will include those time zones. Go get the book and watch the night sky and see where constellations are in 2015. This entry was posted in Life and tagged 2015, Astronomy, Book Review, Books, July, Night Sky, Richard Bartlett, Sky At Night. Bookmark the permalink. Sounds good for my son, he love looking at the stars! I always wished I knew someone with a REAL telescope! Lot of good that does me 🙂 Hugs!!! Lucky you are! Haha 🙂 Need a new one though. I left it on my balcony too long and some of the bits have seized. Yes I have heard they are very technical pieces that work in unison I suppose much the same as a camera lens?